Barro is part of the Beagle Brigade at Miami International Airport. The rescue dog is on the hunt for hidden dangers. He’s not sniffing out banned items like weapons and drugs. Instead he and his handler, Aileen Soto, are searching for foreign plants and creatures. Soto is an Agricultural Specialist with US Customs and Border Protection. Barro is an Agriculture Canine. His highly trained nose can detect items X-rays cannot. He can sniff out anything from avocadoes to mangoes. The items may not seem like a big deal to keep out, but it’s a huge effort to avoid problems that can happen if banned items are allowed in the country. 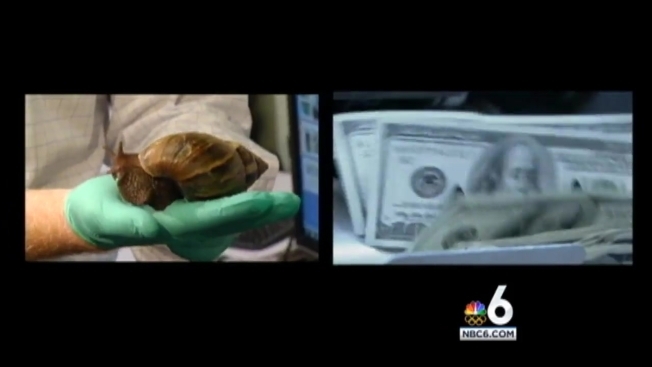 In 2010, federal officials say African Land Snails were smuggled in to the country through the luggage of an African Priest in Hialeah. The snails carry diseases and even eat through the stucco of homes. The snails multiply quickly and efforts to find them cost taxpayers $3 million in 2015 alone. One smuggled, contaminated piece of fruit is blamed for the Mediterranean fruit fly outbreak in the 1980s. It cost taxpayers approximately $100 million to get rid of it. What Barro and the other nine dogs at Miami International Airport find are taken to a special holding area at the airport. Inside are dates from India, salami from Italy and large guavas from El Salvador. It looks like a market and smells like one too. But you wouldn’t want to eat the food. Inspectors go through each piece looking for larvae and diseases. And frequently they find what they’re looking for on the smuggled items. The rest goes into a huge food grinder and is destroyed. You can face fines for bringing banned items into the country that can go all the way to $60,000. Click here to see a list of banned items. And click here to see a list of approved items.